Mazda's new U.S. marketing campaign is the company's biggest in two years and includes a 60-second spot called "A Driver's Life," narrated in sentimental rhyme by "Breaking Bad" actor Aaron Paul. LOS ANGELES -- Fifteen years after coining the slogan "Zoom Zoom" to pitch its cars to customers who see driving as a pleasure and not a chore, Mazda Motor Corp. is hoping to refine its fun-to-drive message by launching its biggest U.S. marketing campaign in two years under a new tag line: "Driving Matters." "When we go into a focus group, we do a first opening statement. 'When I say Mazda, what do you think of?'" said Russell Wager, vice president of U.S. marketing at Mazda. "Nine times out of 10 they say 'Zoom Zoom,'" he added, banging a table for emphasis. "Then I'll ask them to explain to me what 'Zoom Zoom' means, and I'll get six or seven different answers. That's what Driving Matters is supposed to address. It's supposed to solidify what 'Zoom Zoom' means to people." 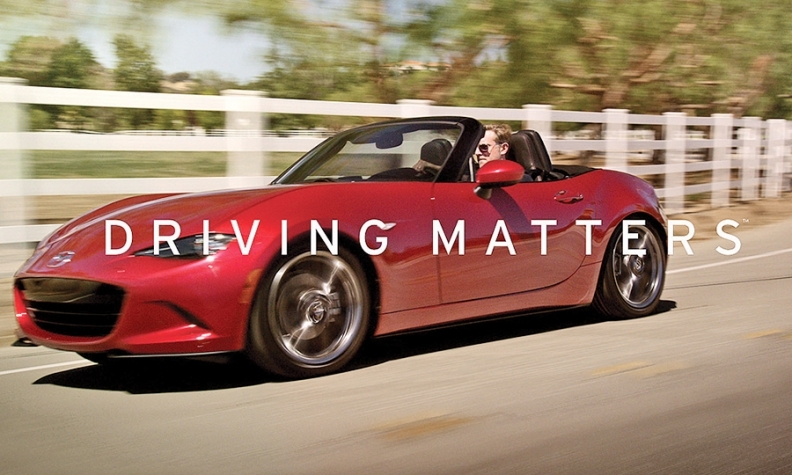 Mazda began its push late last week with a 60-second spot called "A Driver's Life." Narrated in sentimental rhyme, the advertisement shows a man's life arc from one sports car to another. He drives a beat-up MX-5 Miata roadster through college. When he gets married, he buys a Mazda3 for practicality's sake, followed by a CX-5 crossover to fit a growing family. In middle age he buys a new MX-5 because it "reminds you of when you were you," as the actor Aaron Paul, best known for his role in the TV series "Breaking Bad," says in a voiceover.